Sometimes I wanna dress up but sometimes I just want to be comfortable yet pretty. There are numerous kinds of dresses out there but there are three women casual dresses design that you need in your closet for these days. Instead of curling up in jeans or sweatpants, opt for a stylish dress instead. Flare dresses are so comfortable to wear and they feel so girly especially when you twirl around in its flowy skirt! They're great for warm days too. 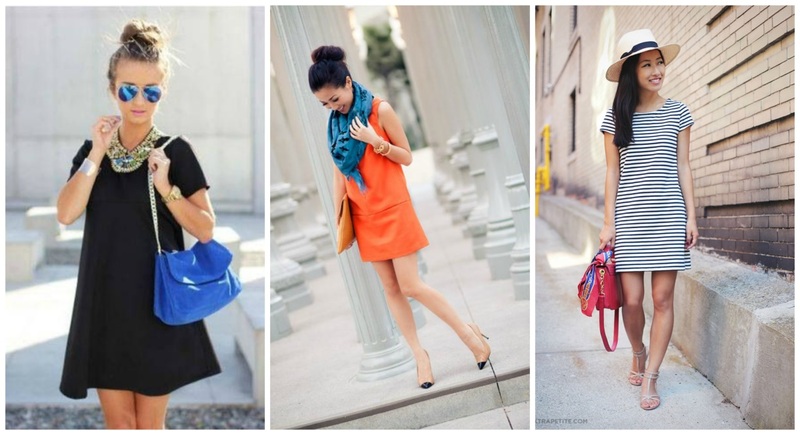 Shift dresses are also great for casual wear. They are designed with a loose fit so they are perfect for ladies with bloated tummies or love handles, as opposed to bodycons. Keep your tummy a secret ;) The cutting and design of shift dresses also make them a versatile piece to wear to the office, dinner parties, formal events and more. And lastly, every girl needs at least 1 maxi dress! Not all of them feel hot even though they have much more fabric. Pick one with light weight material and it will feel fine. It is important to find maxis that are perfect for your height though. Once you do, simply slip it on and you're done! Minimal accessorizing needed and it feels super duper comfortable. A very informative dress. I am someone who just shops first, match later. Sometimes, cannot find suitable matches, so have to buy more! Babe! love the style especially that lil black dress. For dancers, be it guys or girls, we always go around with at least 4 sets of clothes and 2 extra pairs of shoes in the car. That's our essential daily must have with us. LOL. I love comfortable wear. I wear it especially on weekends so that I can feel more relax. Beautiful dresses... I haven't got but it's a good suggestion to add it up in my closet..
Wow, good review about fashion casual dresses.. But it is not easy to find the size which suitable for me..:D Many shops sell the small dresses..
Yea I love flare dress! It's simple enough and easy to match with any shoes. Jackets for me please. Mix and match em with anything and it will make you look so chic and classy! great ideas here, i don't really have some of these dress types featured here, definitely need to add them to my wardrobe. Beautiful dresses! I am a person who loves to wear the clothes where I am comfortable then going for what is trendy.